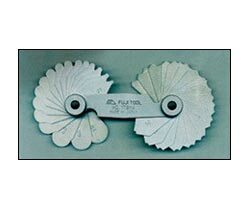 Radius Gauge (178) is used for inspection and measurement of raadii. It is also used for checking convex and concave radii of tool patterns and other machining jobs. We as a Supplier, Exporter and Importer and provide our customer various gauges in different sizes with the free demo. It is available in different models from models 178 to 213 with different Range and Raadii each leaves stamped with size. High precision is guaranteed. Our veteran team of quality checks quality and provides after sales services very well.